This type of Hmong hat or headdress is worn by Hmong who lived in Sayaboury and they wear sev plooj. I believe some types of Hmoob Dub also wear a similar hat with a skirt. A small coin belt/sash is placed around the hat as well. First make a pom pom boa of out of yarn. 2. Cut interlock into two shapes. The first shape is a circle with a slight point for the top of the hat. The other shape is used for the side of the hat. 3. Sew purple cloth onto the second shape. First hand baste the purple fabric onto the interlock canvas. It works best with a fabric that has some stretch to it. 4. Cut an old t-shirt to sew on the inside of the second shape. It doesn’t really matter which color since it will be on the inside. Fold the edges and hand sew the t-shirt to the interlock and purple fabric. Remove baste stitches when down. 5. Cut 2 pieces of black fabric a little large that the top of the hat. Take one piece of black fabric and fold the fabric over the interlock. Hand baste stitch the fabric to interlock. Take the second piece and tuck in the edges and hand sew to the interlock and first piece of fabric. Remove baste stitches. 7. Take the purple piece and wrap it around your head. Pin the edges together. Hand sew the edges. 8. Take the top piece and sew onto the top of the purple piece. Since the purple piece is drawn at an angle it should be slanted. This hat does not look pretty if there isn’t an angle. 9. Take the siv ceeb with the larger print and wrap around the bottom of the hat. Make sure one piece over laps the other and to leave about 1 cm of purple showing. Hand sew the siv ceeb onto the purple layer. Alternate the different type of siv ceeb and repeat. Make sure to wrap in the same direction for each layer. 10.. Place the pom pom boa on the edge and top of the top of the hat and hand sew the boa on the hat. 11. Place the siv paj co on top of the hat. Hand sew it on the top. You can leave a little bit to hang off the back. 12. I store the little money belt away separately so that it doesn’t tarnish. When wearing the hat place a little money belt below the pom pom. Thank you for reading! 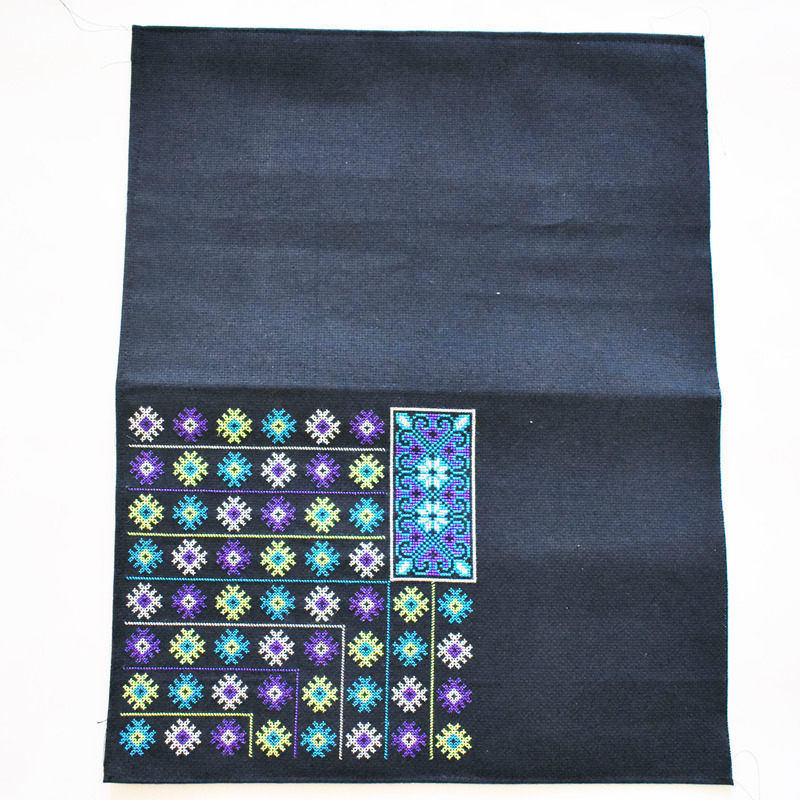 Let me know in the comments below if you want to see more tutorials on Hmong clothes. Hi everyone! 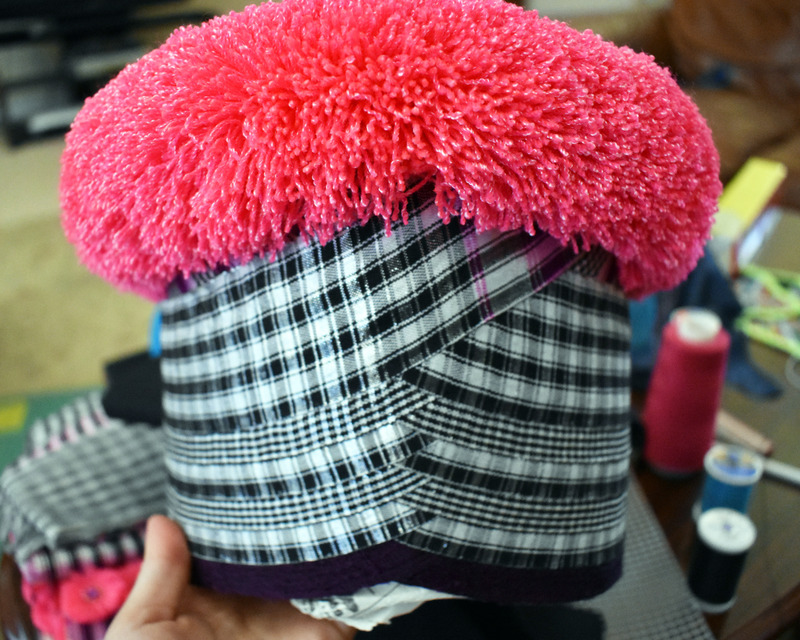 Today I’m sharing how to make a Hmong hat. I remember I spent one summer many years ago working on the embroidery of the hat and making pom poms. I think I embroidered about 6-8 pieces. My mom made them into hats and there was one left that was unfinished. This summer I decided to finish it so that I could learn how to make this Hmong hat from start to finish. This type of Hmong hat is worn with sev plooj and pants. First, you need to complete the embroidery for the top of the hat. Above I have an example of the pattern I used. Feel free to change up the colors. I start from the bottom right corner, leaving some room at the top. The top piece will be tucked into the part of the hat later. 2. Iron on the interface to the back of the embroidery. This will help make the top part of the hat sturdy. Fold the piece in half and iron to make a nice crease. Tuck in the outer edges. edges to make it neat and sew the tucked edges with a sewing machine. 3. Fold the piece in half and iron to make a nice crease. Unfold. 4..Tuck in the outer edges to make it neat and sew the tucked edges with a sewing machine. 5. Fold in half along the crease. 6. Sew the left and bottom sides with a sewing machine. The top edge should be the crease and the right edge should be open. 7. Now you can add pom poms to the top piece. I used 6 beads per pom pom and attached the pom by going through the center threads used to tie the pom pom. I attach 1 pom on top and 1 on the bottom and leave a little over 1 inch in between the pom poms. 8. After you attach the pom poms it should look like this. 9. Now cut out 1 circle out of the interlock canvas (white grid). The circle above is about 7inches in diameter. A circle with the diameter of 7 will make the circumference of the hat about 22 inches. If the circumference of your head is bigger cut out a bigger circle, if smaller cut out a smaller circle. 10. Cut out 2 circles out of the black cotton fabric. This circle should be larger than interlock circle. 11. Iron on the interface to the black circles. 12. Hand sew the black circles onto to the interlock circle. 13. For the first black circle, place the interlock onto the interface side and fold the edges of the black circle over. Sew the edge of the circle. 14. The second black circle will hide the overlapped edges of the first. Again place interface side down onto the interlock. Tuck the edges of the circle in and sew. 15. Cut out a rectangular piece of interlock. The length should be the circumference of your head + ~3 inches. The width is about 5 inches. For reference, my measurements were 25 inches X 5 inches. 16. Cut out a rectangular piece of black cotton, It should be about 1 inch longer than the interlock about 2 times wider. My piece was about 26 inches x 12 inches. 17. Place the interlock on top of black cotton near the top edge. Leave about 1 inch of room. Fold the top of the edge down and sew onto the interlock. 18. Fold the sides in and sew onto the interlock. 19. Take the top piece and place it over the interlock and center. 20. Fold the bottom of the black cotton over the interlock. Tuck the edges and sew. 21. Overlap the edges of the rectangle to fit the size of your head and then hand sew it closed. 22. Place the circle on top and sew it on top of the edge of the hat. 23. Flip the top piece of the hat over onto the circle. *** I forgot to take a picture of the finished hat with siv ceeb so I used a photo of a different hat instead. 24. Fold and sew siv ceeb at the bottom of the side of the hat. I usually have 3 black stripes and 2 white stripes and sew it a little less than an inch from the bottom. 25. Optional: Attach small coins to the front of the hat. Thank you for reading! Please like, comment, and share. Happy Wednesday, everyone! Right now I’m in China visiting a friend. Being exposed to different ethnic minorites here inspires me to make more Hmong clothes. I probably need to invest in a better sewing machine since my sewing machine is about to give out on me. This outfit was made by my mom and I made the hat. Even though there are trendy modern outfits, I still love and appreciate simple more traditional Hmong clothes. My mom usually makes me at least a new outfit a year if not she makes me multiple. Growing up, I helped her and this year I decided that it was the time that I learned how to make them on my own. Even though I am still a beginner, I want to spend time writing down the steps so I don’t forget. In the outfit above, I am wearing a shirt, apron, skirt, belt, and sash. The belt is actually too long for me to tie so I have to safety pin it. I love the colors of this outfit and can’t wait to wear it during Hmong New Year. Personally, my favorite piece to sew is the apron. There are different ways to sew it and in a future post, I’ll share my tips and tricks. This hat is the first that I made by myself and kinda went on a hat making spree afterward. 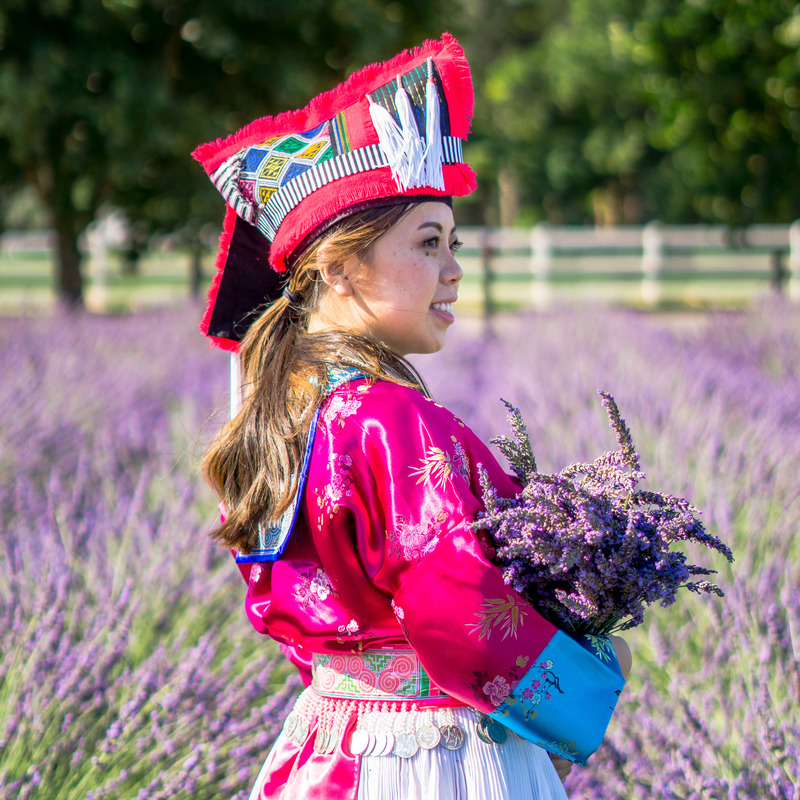 This hat is based on phuam paj a type of head wrap worn by white Hmong that lives in the region known as Tsua Noog Roov towards the Khammoune region of Laos. I loved bright colors of the headdress. By making it myself, I was able to customize the hat. The sparkly siv ceeb brightens the hat and my complexion. While looking at hats, I noticed that some people cut costs but not using siv ceeb and used a gingham print fabric instead. The only thing that would take a while would be the embroidery on the two panels of the hat, but that was actually my favorite part. The focal point of the hat is the colorful embroidery. In order to replicate the look of a head wrap, tuck one panel in at the top and place it at angle. Currently, I am trying to balance my wanderlust and my sewing projects. It doesn’t help that traveling inspires me to make more outfits. I already have a list of things to try to make when I get back to the U.S. Additionally I ran out of room to store my Hmong clothes so when I get back I have to reorganize them and find a solution. Stay tuned for a tutorial on how to make the hat. I’m going to post a different hat tutorial first because I have access to those photos during my trip. Thank you for reading and comment below to share your current project or how you store your Hmong clothes.